ATLAS, CLEO, Dark Energy Survey, LSST, FOCUS, CDF, Mu2e, G-2, Daya Bay, E-906 (SeaQuest) and USQCD. Dark Energy Survey, FOCUS, CDF, Mu2e, G-2, SeaQuest and USQCD. CDF muon systems, CDF trigger, CDF central tracking chamber, G-2 design, Mu2e design, Dark Energy Survey electronics and ILC design, among many others. Charm, bottom and top quark physics, heavy bosons, electroweak symmetry breaking, dark energy, rare muon decays and muon g-2. WHAT SETS PARTICLE PHYSICS AT UNIVERSITY OF ILLINOIS URBANA-CHAMPAIGN APART? We have strong high- and medium-energy groups. 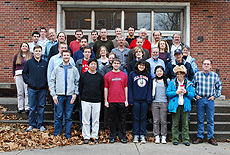 Fermilab collaborators at the University of Illinois Urbana-Champaign. University of Illinois scientists in the CDF trigger room. Top row from left: Ben Carls, Greg Thompson and Olga Norniella. Bottom: Heather Gerberich.